2 product ratings2 product ratings - Seydel SESSION Harmonica w/ Black Leather Case! - Pick Your Key! They're great for playing COUNTRY, R&B, POP, WORLD BEAT, AFRICAN and REGGAE. This tuning makes it easier to play many songs.. that can be difficult, or impossible, to play on a standard Major Diatonic.. IN CROSS HARP. Hering's Chromatic Harmonica in key of E. Appears to be in good condition with no missing screws or parts. They belonged to my father who passed away. A professional level diatonic harmonica, the Suzuki Promaster is constructed with machined phosphor bronze replaceable reed plates. Its reed plates are the result of computer-aided laser cutting and they yield a tuned and bendable reed system. WILL WILDE ROCK TUNING Seydel Session Steel IN STOCK READY TO SHIP! Ever wanted a Hammond organ that will fit in your pocket?. Look no further. The HA-20 Promaster Hammond harmonica carries the colored Hammond organ logo, which looks great against its black shell. The HA-20 Suzuki harmonica features phosphor bronze reeds and includes a hardshell carrying case. The Seydel Blues Classic 1847 Harmonica is first serial-produced Richter-diatonic harmonica with stainless steel reeds. Diatonic harmonica with waterproof Maple Comb. If you’re not satisfied, neither are we. Central to Oskar's design is a smooth plastic comb that doesn't swell like traditional wood combs. You no longer need to toss out a harmonica because a reed or two has gone south. The reed plates have wide chambers and narrow dividers for faster, easier playing. The front of the bottom cover is raised at the lower end and tapers off towards the high end. This gives the draw reeds sufficient space to vibrate freely at even the lowest pitches without striking the cover, thus eliminating reed rattle. The wide open coverplate design with side vents give the Rocket the punchy loud sound that professional harmonica players crave. 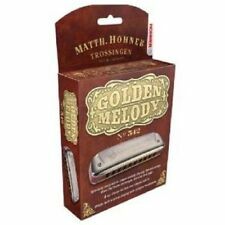 Hohner Rocket Harmonica. This harmonica features a rounded plastic comb and cover plate designed for maximum comfort. I later discovered I wasn't the only one to think of the Richter Extended idea back in the 1980s. They demurred, but did agree to make his SBS 4-octave model out of the Hohner 365 14-hole harp, released in 1989. If you've never seen anything like our new PH-20 Pipe Humming harmonica, there's a good reason. It's the only harp of its kind. The hauntingly beautiful sound of a harmonica vibrato is now as easy as playing the blues. The FAVORITE is a diatonic harmonica with translucent anodized aluminium comb and high stainless steel covers in 29 keys and many special tunings. Limitations and Exceptions. If you’re not satisfied, neither are we. The FAVORITE is a diatonic harmonica with translucent anodized aluminium comb and high stainless steel covers in 29 keys and many special tunings. Kansas City, MO 64161-9231. 4005 N Norfleet. (Your RA #).